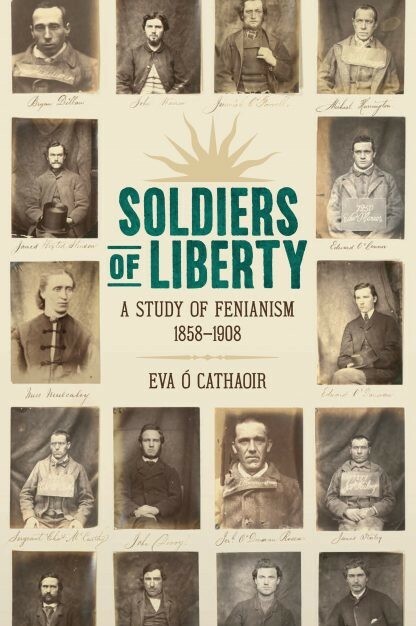 ‘Soldiers of Liberty – a Study of Fenianism 1858-1908’ by Eva Ó Cathaoir. Published by Lilliput Press, Dublin. Price hardback €60. Like Fenianism itself, this book had modest beginnings but grew to cover all of Ireland, a good part of the globe and half a century. Eva Ó Cathaoir began a study of Fenians in Tipperary which has evolved into one of the most comprehensive and important scholarly works on the Irish Republican Brotherhood yet published. The recent visit of the Pope revived debate among Irish republicans about the role of the Roman Catholic Church in Irish politics. This book shows again that, with very few exceptions, the hierarchy abhorred the IRB for its democratic and republican principles and the ‘princes of the Church’ feared Fenian inculcation of their ‘flocks’ with a sense of independence, no longer reliant on clerical and aristocratic leaders to guide them. Such guidance had led to catastrophe during the Great Hunger as the passivity preached by Daniel O’Connell and the bishops facilitated the peaceful passage of food out of a starving country. Students of Irish history will be familiar with the story of the Fenian leadership on both sides of the Atlantic, abortive rebellion and invasion, the internecine disputes and personality clashes. This book recounts all that but it goes much deeper. For example it tells of the Fenian women, whose stories surely need to be rediscovered. They were treated as subordinates by most of their male comrades but many played important roles. It was a time of deep chauvinism with even otherwise progressive Fenians such as John Boyle O’Reilly opposing votes for women. The book covers all aspects of Fenianism and a great part of its value is in its first Appendix ‘Biographies of Munster and Kilkenny Fenians’ which provides brief profiles of 1,000 rank and file Fenians. I have never before seen any ‘Roll of Honour’ of the IRB but this is now provided with a list of ‘Fenian Casualties 1865-92’ while the book closes, appropriately, with a list of Fenian monuments in Ireland and Manchester. This is a beautifully produced book and a credit to the publishers Lilliput Press and of course to the author.